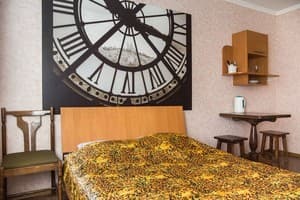 The mini-hotel "Neon" is located in 1.35 km from the National Museum-Estate of MI Pirogov and 100 meters from McDonald's. In the mini-hotel around the clock hot water, high-speed Wi-Fi, in the rooms there is a double bed with orthopedic mattress. Towels and bed linen are provided. The bathroom also has soap and shower gel. In the kitchen there is a kettle and a microwave and all the necessary utensils. The mini-hotel "Neon" is located on the 1st floor of a 9-storey building. Near the house there are supermarkets, parking, entertainment and a park area. Fountain Roshen is at a distance of 5.36 km from the mini-hotel, the railway station is 7.5 km away. 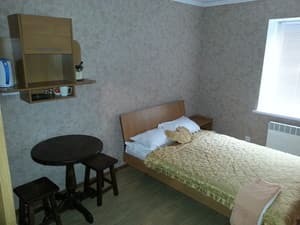 Description of the room: Rooms with double beds with orthopedic mattress. Description of the room: It's like a studio apartment, but without a stove. There is a refrigerator, microwave, kettle, dishes. 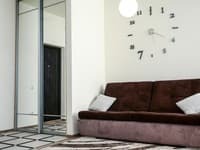 Ideal for guests who plan to arrive for a short time. Very good location, excellent transport interchange. Description of the room: It's like a studio apartment, but without a stove. There is a refrigerator, microwave, kettle, dishes. Rooms with double beds with orthopedic mattress. . Ideal for guests who plan to arrive for a short time. Very good location, excellent transport interchange. Description of the room: Elite area, secured people, always a nice and clean yard. Paid parking, shops, bars, cafes, shopping center - all nearby. It is easy to get to the center, both by car and on foot. The most expensive and steep place in Vinnitsa. Additional places are not available. Accommodation of children is free of charge without providing a separate bed. Accommodation with animals by prior arrangement. Near the house there are supermarkets, restaurants and bars. 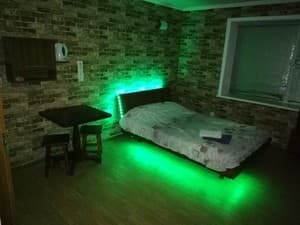 Mini-hotel "Neon" is located in 1.35 km from the National Museum-Estate of MI Pirogov and 100 meters from McDonald's. Fountain Roshen is at a distance of 5.36 km from the mini-hotel, the railway station is 7.5 km away. From the stop "Railway station" bus number 5 to the stop "pr. Yunosti" (15 stops).